Staying healthy is a priority at my house. Since I own my own business working from home and have a toddler to watch full-time, I don’t get sick days where I can lay in bed and nurse myself back to health. I often spend enough time taking care of my family when they are ill, which is equally not fun. Practice hand washing with kids. We decided to get my daughter her own soap dispenser and have a stool next to the sink so that she can wash her hands. We practice hand washing before and after we eat, after we use the restroom, and after we come in from outside. This process is so natural to my three-year-old that we almost don’t even have to remind her now. We have made a huge difference in eliminating the germs in our home simply by wiping down the door handles often. Especially the knobs to the bathrooms and the bedrooms. I like hugs, but not if you have a bug. We try to practice avoiding close contact with those that we know are ill and make sure to wipe down surfaces before we touch them (especially grocery store carts). Did you know that there is a difference between cleaning and disinfecting? Cleaning will remove the dirt and germs, but disinfecting surfaces can further remove the bacteria and prevent germs from transferring to other family members. Maintain a balanced diet make sure you get enough exercise. By getting up and moving with your family you can keep healthy! I have been exercising a lot lately and have missed the bug the past few times that my husband has gotten sick. My immune system is stronger and I feel better overall. Usually, if I do fall ill, I bounce back much quicker if I am taking care of myself by eating the right foods and moving my body. 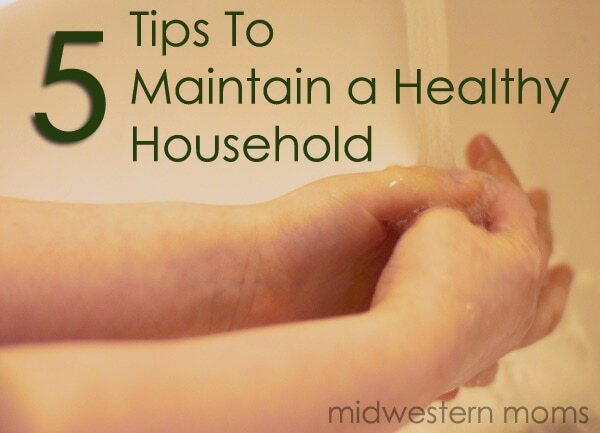 What tips do you practice to maintain a healthy household?